Maintained by Benjamin Grosser and hosted by the Beckman Institute Visualization Facility. 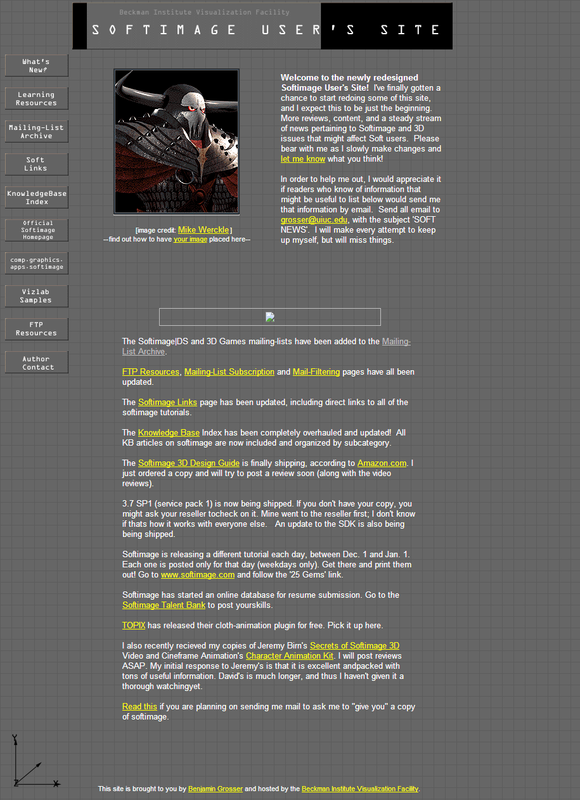 The Softimage User’s Site (http://www.itg.uiuc.edu/softimage), garnering thousands of hits from around the world daily, provides a tremendous amount of information on Softimage. The Learning Resources section provides links to online tutorials, books and sample databases. The KnowledgeBase Index is a quick-link to all of Microsoft’s Softimage KB entries. Of most importance is the Softimage Mailing-List Archive, a web-browsable and searchable archive of all nine of the Softimage Mailing-List’s, dating back to 1994. The Softimage Mailing-List’s are the primary source of troubleshooting and technique information on Softimage, with an average of 40-50 messages per day on the 3D list.